Kay Cromartie doesn't have to look far for inspiration--it's all around her. From the idyllic countryside scenes of her rural community in south Georgia, to the Tennessee Walking Horses she raises on her farm, to the many surrounding plantations, Kay captures the beauty around her in original watercolors, oils, and acrylic paintings. She also provides professional art restoration services. 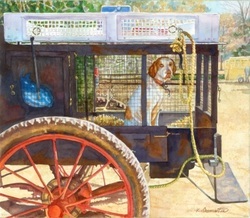 Click the links above to view galleries of her work.